Chris Evans - a classic car nut and speed freak - has already ruled himself out of the running, but here are some of the people producers may (or may not) be considering. Model Jodie Kidd is a former racing driver who currently presents The Classic Car Show on Channel 5. "I've always liked everything high-octane," she told The Express last year - and, true to her word, she once held the pole position on Top Gear's "Star In A Reasonably Priced Car" leaderboard, completing her circuit in 1 minute, 48 seconds. As a friend of the programme - she also took part in 2010's Ashes Special - she is likely to be high on the producers' wishlist. But last year, she ruled out a permanent role on the show: "I couldn't join those boys. No, God no," she told the Radio Times. On Red Nose Day, affable comedian John Bishop was among the first to lampoon Jeremy Clarkson over his suspension. Imploring viewers to send money to poverty-stricken children in Uganda, he said: "I'm not saying I'll punch someone over food - that's Jeremy Clarkson's job." The star's irreverent humour, combined with an eye for telling detail, make him a perfect fit for Top Gear's shaggy dog storytelling. The show's endurance challenges won't pose a problem - he once cycled overland from Australia to Liverpool to raise money for the NSPCC. And he's another high achiever in a Reasonably Priced Car. His lap time, driving a Kia Cee'd, was 1 minute, 42.8 seconds. Suzi Perry has been covering Formula 1 since 2013. Before that she was the BBC's MotoGP motorcycle racing correspondent for 13 years. She undoubtedly knows her stuff - and, it transpires, she's been asked to host the show before. "Years ago, when TV was about to bring Top Gear back and rebrand it with Jeremy, James [May] and Richard [Hammond], I sat down and talked to Andy Wilman, the series producer, about joining them," she told the Telegraph last year. "I remember thinking, 'I might be out of my depth and it might not be a good idea', instead of grabbing the opportunity. "Looking back, I may have made a large error, but it's not like I didn't work for the next 15 years. I don't regret it - but it was probably a bad decision." Recently released from his ITV contract, Adrian Chiles is undoubtedly looking for a new, high-profile TV job. A hugely talented sports broadcaster, he is better known for football punditry than his knowledge of cars - but he once spent a day shadowing motor racing boss Eddie Jordan for a BBC documentary. His everyman style and droll sense of humour would be a good fit for Top Gear - but BBC bosses will note that Chiles was once forced to apologise by ITV after implying Polish football supporters were all builders. Given Top Gear's track record, though, that might be considered a qualification. When most of her peers were obsessing over Duran Duran, Vicki Butler Henderson fell in love with a Volkswagen Golf GTI MkII. She began racing 100cc karts at the age of 12 and was overtaken by David Coulthard in her first race. But she also went on to became the first women ever to win a Maserati race, in 2002. A former road Tester at What Car? magazine, she made regular appearances on Top Gear before jumping ship to work as a presenter on Channel 5's Fifth Gear. Butler-Henderson counts Jeremy Clarkson as a friend, meaning he may put in a good word for her with Top Gear's producers. He heaped praise on her driving skills after racing her in 2010. "I was in an Aston Martin DBS convertible. She was in a Ferrari California and we had most of Silverstone to play with. By rights, I should have kicked her arse. I had four more cylinders, a million more horsepowers and two more testicles. I didn't though. I couldn't even get close. Yes, he ruled himself out - but that was before Clarkson was sacked. 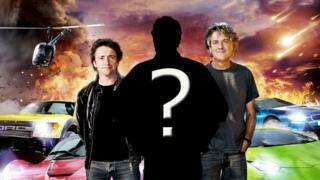 The BBC Radio 2 presenter is a self-confessed petrolhead, who has one of the most prestigious car collections in Britain. Among his previous purchases is a £12 million 1963 Ferrari 250GTO. He's also admitted that he'd be a good fit for Top Gear, telling his breakfast show audience: "From what I've seen on Twitter and various social media, there's a 50/50 split approximately as to whether me being involved in the show is a good idea. "However, I'm in the 'no' camp. So regardless of whether it would be a hit, I'm voting a no for myself on that show, so that's never going happen." No doubt the BBC will try to change his mind over the next few months. When Clarkson was suspended, a petition to have Alan Partridge installed as his successor attracted thousands of signatures. Partridge drove a Rover 800 - and wore a Castrol GTX jacket to a funeral - but his real-life alter-ego, comedian Steve Coogan, is a serious car enthusiast. He once owned a £100,000 Ferrari, but used it so little he admitted that "for a round trip from Brighton to Manchester and back it would have been cheaper to hire a twin-engined light aircraft". However, he is not a fan of Top Gear's humour. "If I say anything remotely racist or sexist as Alan Partridge, for example, the joke is abundantly clear. We are laughing at a lack of judgment and ignorance," he wrote in The Observer four years ago. "With Top Gear it is three rich, middle-aged men laughing at poor Mexicans." The list of potential candidates is long and exhaustive. Former racing drivers Tiff Needell, Eddie Irvine and Eddie Jordan are all being tipped by bookmakers, as are London Mayor Boris Johnson and Jamiroquai singer Jay Kay. X Factor presenter Dermot O'Leary, owner of a classic 1968 Volkswagen Karmann Ghia, has also been mooted for the job, as have Geordie duo Ant and Dec.
Charismatic motorcycle racer Guy Martin is considered a fan favourite. He previously presented a series on land speed records for Channel 4 - which saw him set a new world sledge speed record of 83.5 mph. Rowan Atkinson - who is currently the second-fastest "Star In A Reasonably Priced Car" at 1 minute, 42.2 seconds - is another contender, although the BBC may struggle to insure him. The Blackadder star is responsible for the UK's biggest ever car insurance payout. It cost his insurance company £910,000 to repair his 240mph McLaren F1, after he crashed it into a tree in 2011.